Guatemala achieved a breakthrough for justice today with the opening of the landmark criminal trial of Efraín Ríos Montt, former military dictator, for genocide and crimes against humanity. Ríos Montt, along with his chief of army intelligence José Mauricio Rodríguez Sánchez, is charged with ordering and overseeing a bloody counterinsurgency campaign during his 1982-83 regime that sought to wipe out guerrilla forces and anyone who supported them. The indictment accuses the two retired generals of responsibility for fifteen massacres in the Ixil region of the country’s northwestern Quiché department, resulting in the deaths of 1,771 unarmed men, women and children. The proceedings will begin with a review of the evidence by Judge Miguel Ángel Gálvez. The prosecution plans to propose 142 witnesses – among them, relatives of victims and survivors of the massacres – and 64 experts, including military analysts, forensic scientists, anthropologists, scholars, investigators and psychologists. Documents will include military records, counterinsurgency campaign plans, field reports sent from the killing zones to the high command, and the findings of the UN-sponsored Historical Clarification Commission, which in 1999 concluded that 200,000 civilians died or disappeared in the 36-year conflict. The truth commission also found that Guatemalan army, police, and paramilitary forces were responsible for 93 percent of human rights violations committed during the war. 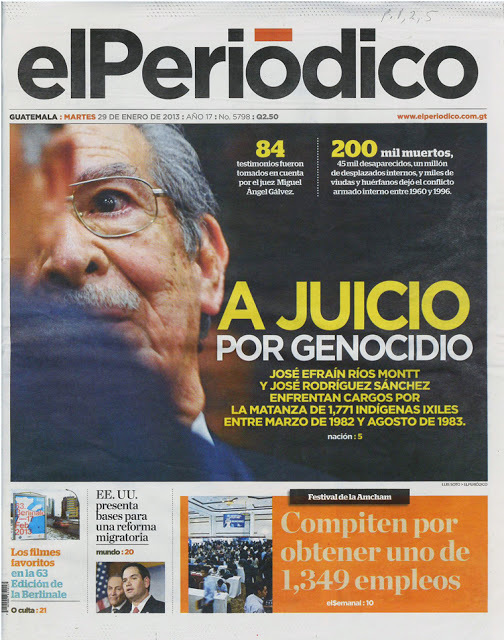 Ríos Montt was indicted for genocide in January 2012, but a flood of appeals, amnesty requests, and other delay tactics by the defense prevented the case from advancing. When Judge Gálvez ruled on Monday that the trial begin, he rejected 13 appeals that were still pending. Francisco Palomo, one of Ríos Montt’s defense lawyers, told reporters yesterday that the legal team is now preparing an appeal of the judge’s decision to open the trial, which he called a “political lynching.” “There is no document or testimony that can prove that my client participated in the crimes of which he is accused by the Public Ministry,” declared Palomo. He claimed that the ministry’s motives in the case stemmed from the fact that it is “full of ex-guerrillas” – an implicit reference to the Attorney General, Claudia Paz y Paz, whose family members are alleged by the military to have been members of the insurgency. The defense appears to be relying on its ability to separate Ríos Montt’s role as former chief of state from the human rights crimes committed by his soldiers operating in the field. The tactic ignores the famously strict military hierarchy that operated during the height of the armed conflict, with orders flowing from the commander-in-chief down to his officers in the military zones, who in turn sent their after-action reports back up the chain of command. One of the key pieces of evidence that will be introduced by the prosecution is a set of army records associated with Operation Sofía, a violent counterinsurgency sweep through the Ixil region in July and August, 1982. 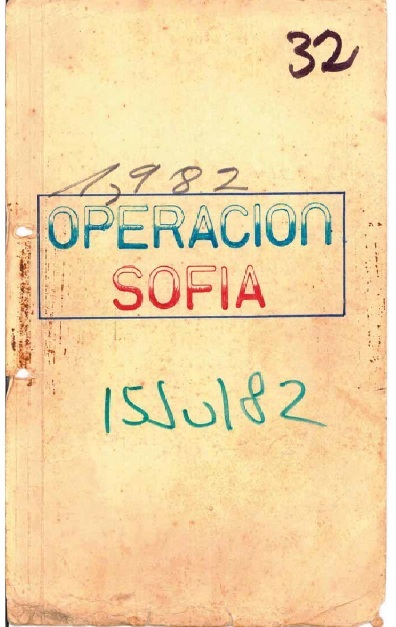 The Sofía documents – which were obtained by the National Security Archive from a confidential source in 2009 and subsequently authenticated and provided to the lawyers in the genocide case – demonstrate the extent to which the brutal tactics used by troops sweeping through Mayan settlements in search of the enemy were controlled by the Guatemalan high command. The reports contain multiple references to the murder of unarmed civilians, razing of villages, slaughter of animals, burning of crops, and indiscriminate bombardment of refugees fleeing the violence. Survivors of the scorched earth operations have fought for recognition and justice for thirty years, with tireless assistance from the Center for Human Rights Legal Action (Centro de Acción Legal para los Derechos Humanos—CALDH), the Association for Justice and Reconciliation (Asociación de Justicia y Reconciliación—AJR), and other local and international organizations. The National Security Archive’s role began in 1994 as peace negotiations were underway, when the Archive launched a documentation project to obtain declassified U.S. records that would expose new information about the hidden history of the Guatemalan conflict, the mechanisms of state repression, and the role of the United States in backing the army’s counterinsurgency campaign. Following the signing of the 1996 peace accord, the Historical Clarification Commission – drawing on the U.S. and Guatemalan records as well as thousands of testimonies, exhumation results, and human rights reports – opened the door to international legal action in 1999 by declaring that “acts of genocide” had taken place in Mayan areas of the country during 1981 and 1982, including the Ixil Triangle. The conclusion convinced Guatemala’s leading Mayan activist, Nobel Peace Prize laureate Rigoberta Menchú, to file a genocide case in the National Court of Spain, which the Archive supported with expert testimony and documents. That case – and the Archive’s participation in it – is chronicled in a documentary film released in 2011, Granito: How to Nail a Dictator. To see the film streaming for free on the Web site of the documentary film program P.O.V. (until February 11), go here. Today, the national genocide prosecution will seek to include the witnesses, experts and documents developed for the Spanish case among the evidence it will propose to Judge Gálvez. Once the court makes a decision about the admissibility of the evidence – which may take days or up to several weeks – the proceeding that opens this morning will conclude and the oral “debate” phase will begin before a panel of three judges. The National Security Archive will be there, observing – or participating. Watch this space. ← National Security Archive Files Appeal Explaining Why CIA is Dead Wrong to Claim The “Predecisional” Exemption for Its History of the 1961 Bay of Pigs Invasion. Reblogged this on Cascadia Solidaria. Reblogged this on Guatemala Info.